Orphaned as an infant in Somalia, Dahabo lost her leg after she was caught in crossfire at age 14. Seeking support and protection, Dahabo enrolled in RefuSHE's Girls' Empowerment Project in 2009. Our staff recognized a special spark in Dahabo and sponsored her to learn the centuries-old craft of resist-dye. After completing the class, Dahabo was eager to teach her peers this traditional East African craft. The program has grown into a key part of RefuSHE's holistic model. 70% of the 160 artisans who have been a part of the collective are economically independent. RefuSHE's social enterprise is a step in the journey toward independence and a new life after war and conflict. Members express themselves creatively while learning tangible skills that lead to self-sufficiency. Our trauma-informed approach allows artisans to achieve economic and social independence. Participants continue their healing within RefuSHE’s supportive environment while learning entrepreneurial skills. 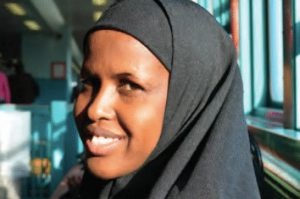 Dahabo is now resettled in the United States, where she continues to serve as an ambassador for RefuSHE. Her designs are still produced in our Nairobi workshop today. We reinvest 100% of the revenue from our social enterprise into RefuSHE's programs and the savings of artisan collective members. Interested in carrying our products in your store? Looking to place a bulk order or collaborate on a custom design? We'd love to work with you!